I was born in Wisconsin but have lived in Florida for many years. From an early age, I knew I would ultimately be deeply involved in some form of art or design. 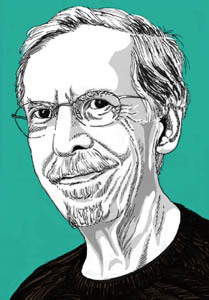 I earned an art degree at the University of Miami, then served in the Army, where I learned silkscreen techniques and produced illustrated training aids. Early on, I gravitated toward dimensional media and so I spent 40+ years designing exhibits and displays, after teaching myself drafting and detailing techniques and acquiring technical writing as well as some business skills along the way.. All this time, I continued to develop my painting and drawing techniques; eventually adding digital imaging. I have worked in a variety of traditional media including pen and ink with watercolor, ceramics, enamel on copper, silk screen, wood and linoleum cuts. I do paint in oils but prefer acrylics. In recent years, I've focused more on fine and applied art and less on my design consulting business although I continue to offer design services to my valued and loyal clients. I have always enjoyed making line drawings, but I also like to work with color, often in a posterized style. My focus is on nature-- organic and botanical forms, landscapes, birds and animals, still lifes; but recently I've begun a series of portraits of notable people, some commissioned for publications. So--all in all--some variations in technique and subject matter; all driven by broad interests, a need to simplify and restate the essence of things and an underlying concern for good composition. Most of my original paintings and drawings are privately held but I enjoy fulfilling commissions for new work in traditional and digital media and I also offer art prints of many images. Sometimes, it's difficult to distinguish fine art from illustrations, so I am comfortable using both terms.. I've waited 'til the end to mention the heraldic art I do for clients all over the world, This evolved from my love of history, especially the medieval period. Here again, I rely on a good base drawing then build on that to a clean and solid result, often in a hybrid style combining traditional line art with digital color application. Please click on the contact page to inquire about commissions or to purchase prints, where available. 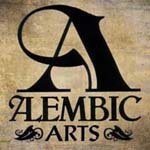 Years ago, I registered my design firm under the name Alembic Enterprises and obtained that domain name, as well. Originally, I created the big A for Alembic Designs, later applying it to Alembic Arts and Alembic Heraldry, too. 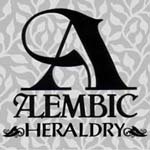 Today, there are lots of websites with variations of the word alembic but my logos remain proprietary copyrighted images that exclusively identify my art and design services.